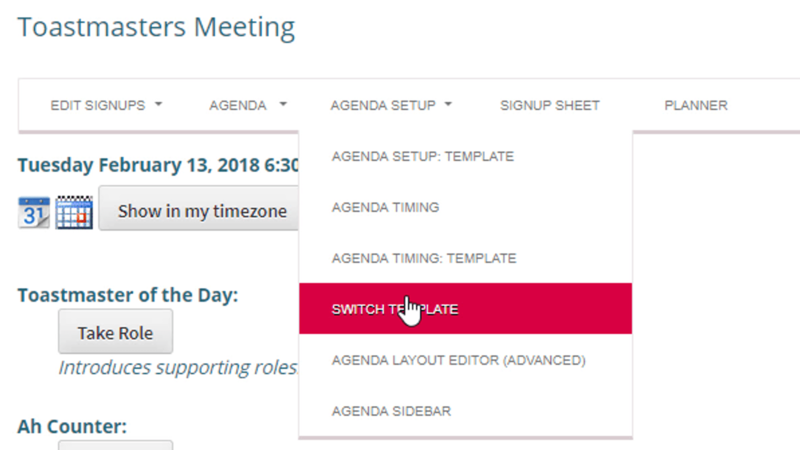 Setting a standard meeting template is one of the keys to using the WordPress for Toastmasters software productively. In addition, it can be helpful to have different templates for other types of meetings or events — with a club level contest as a prime example. If you will hold your contest during one of your regular meeting times, here is how you would switch from your standard meeting template to a contest template. That “Switch Template” option on the menu is new, something I realized was needed to make this option either to find. The other way to get to the “Apply Template to Existing Event” option is through the Dashboard -> RSVP Events -> Event Templates. To make this more useful, you will want to create event templates that reflect how your club runs its contests. See Sample Contest Agendas: International Speech and Table Topics and Sample Contest Agendas: Evaluation and Humorous Speech for examples.